Throughout the last year, the Payara team were tracking all the important activities related to Java and Java EE. We attended many conferences, actively participated in lots of community activities, and we helped to found a completely new MicroProfile initiative, with the aim to facilitate innovation in the enterprise Java space. With this article I'd like to look back at 2016 to share my impressions from the past year with you and outline what we at Payara expect to happen in the Java world in 2017. 2016 was full of great conferences and we're proud that we were able to attend so many of them, both as speakers and as exhibitors. Once again, the Payara Team made an appearance at some very well-known conferences like JavaOne, Devoxx and JAX; but we didn't want to miss the new ones, which meant you could also find us at the JDD conference in Krakow (Poland), GeeCON in Prague (Czech Republic), JEEConf in Kyiv (Ukraine) and Java2Days in Sofia (Bulgaria). 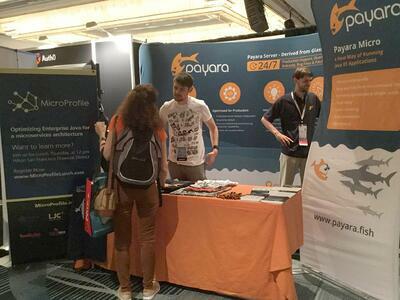 Attending all these events, we were delighted to see Payara becoming more and more popular within the Java community. This year looks very promising too - we've already heard of many more interesting conferences which we're hoping to attend in 2017. Many of them will take place in Eastern Europe, where we've noticed a significant increase in the amount (and quality!) of Java-related conferences, which attract many well-known speakers and a lot of international attendees. Judging from my experience at the conferences in 2016, Java 9, microservices and cloud were the most widespread topics covered by speakers and exhibitors. Reactive applications, functional programming and containerization technologies like Docker and Kubernetes also received lots of attention. In 2017, we expect that these trends will be confirmed and expanded, supported by real-world production examples as the ecosystem around microservices, containers and cloud seems to be maturing and receiving wider adoption. Other interesting topics like artificial intelligence in the cloud, serverless platforms, and optimizations in the JVM are likely to receive more attention in 2017, as innovative technologies like IBM Watson, AWS Lambda and GraalVM continue to mature. Among Java frameworks and tools, Java EE, Spring, Akka and Netflix opensource stack were talked about a lot. Java EE gained a lot of traction, especially in the second half of the year, after Oracle revealed their promising plans with Java EE 8 & 9, following several months of being silent about it. 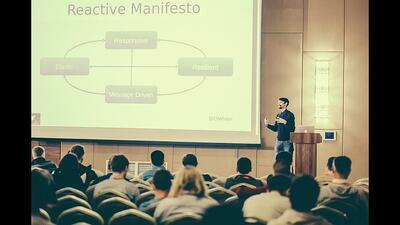 The Payara Team members presented a lot of talks about Java EE in the cloud and within a microservice architecture. We also spoke about how much Java EE already supports building reactive applications; and explained how to easily boost the performance of Java EE applications with JCache standard caching API. Most of our conference presentations focused on explaining how Java EE, Payara Server and Payara Micro meet modern trends. Bearing in mind that current solutions might not be flexible enough in our frequently changing world, and the innovation must progress rapidly, we collaborated with other vendors and the community to unify our efforts to innovate. This led to the formation of the MicroProfile project. We announced the MicroProfile initiative at the DevNation conference in June together with the rest of the founding members. The Payara Team have continued to actively support and talk about microservices and MicroProfile ever since. Payara was one of the first members of the project to provide an implementation of MicroProfile by optimizing the Payara Micro distribution, which is already a very lightweight and flexible application runtime, that provides many features on top of Java EE. MicroProfile released the initial version during the JavaOne conference, and since then it's been adopted by the Eclipse foundation. We're pretty excited about the progress of this new initiative, and we are sure that it will receive a lot of coverage in 2017! In the year of 2016, the Java world was very active, with many important public announcements, high-quality conferences all over the world, and many community events and initiatives. The year 2017 seems even more promising, with JDK 9, Java EE 8, Spring 5 and more expected to be released. All this indicates that Java and JVM are not going away anytime soon - on the contrary - Java is thriving like never before, with a vibrant community and ongoing innovation. We're very excited to see what 2017 brings!